More than 100 girls 'missing' after Boko Haram school attack - Integration Through Media ....! BAUCHI, Nigeria, (AFP): More than 100 girls were missing on Wednesday, two days after a Boko Haram attack on their school in northeast Nigeria that has raised fears of a repeat of the 2014 Chibok kidnapping that shocked the world. Islamist militants stormed the Government Girls Science Secondary School in Dapchi, Yobe state, on Monday evening. Locals initially said the girls and their teachers fled. But fears have been growing about the whereabouts of the students, and one schoolgirl who escaped said it was likely they were taken by Boko Haram fighters. “We have every reason to suspect that they were taken away by the attackers,” said Aisha Yusuf Abdullahi, 16, who returned to her home in Yobe’s commercial hub, Potiskum. Anxious parents and guardians converged on the school on Wednesday to demand answers, with conflicting figures as to how many girls were missing. The Yobe state governor Ibrahim Gaidam said “over 50” remained unaccounted for while the police commissioner of the state said 111 were still missing. “Eight hundred and fifteen students returned to the school and were visibly seen, out of 926 in the school,” said state police commissioner Abdulmaliki Sumonu. “The rest are missing. No case of abduction has so far been established,” he told reporters in the Yobe state capital, Damaturu. The length of time since the attack and Boko Haram’s use of kidnapping as a weapon during its nearly nine-year insurgency has increased fears of another mass abduction. 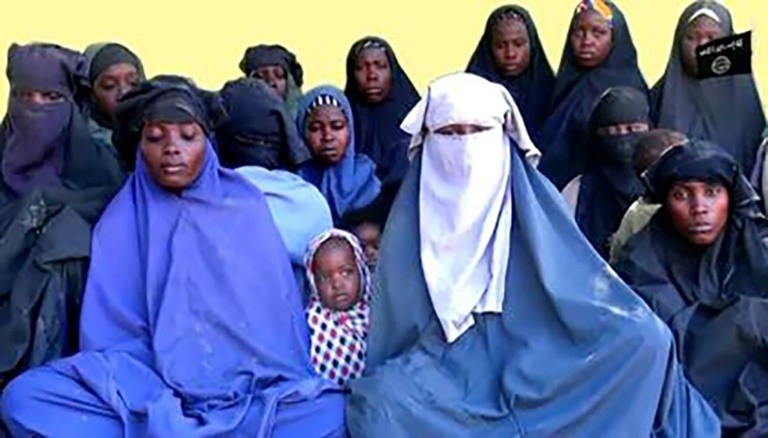 The jihadists gained worldwide notoriety in April 2014 when they abducted 276 girls from their school in Chibok, in neighbouring Borno state. Fifty-seven escaped in the immediate aftermath and since May last year, 107 have either escaped or been released as part of a government-brokered deal. Abubakar Shehu, whose niece is among those missing from Dapchi, said a search of surrounding villages had drawn a blank. “We have the fear that we are dealing with another Chibok scenario,” he added. The state-run boarding school in Dapchi caters for girls aged 11 and above from across Yobe state, which is one of three worst affected by the insurgency. Abdullahi said Monday’s attack was “a traumatic experience” and she was lucky to escape. She and others spent the evening in hiding after running to the principal’s office. “We were in the mosque and about to start evening prayers when we heard gunshots. We rushed out and ran towards the gate. It was closed,” she told AFP. Nigeria’s President Muhammadu Buhari announced after a weekly cabinet meeting that a government delegation led by the defence and foreign ministers will visit Dapchi on Thursday. “I have directed the military and police to mobilise immediately to ensure that all the missing girls… are found,” he added. Boko Haram has seized thousands of women and young girls, as well as men and boys of fighting age during the conflict, which has left at least 20,000 dead since 2009. They include some 300 children who were among 500 people abducted from the town of Damasak in November 2014. Getting accurate information from the remote northeast remains difficult. The army still largely controls access and infrastructure has been devastated by the conflict. In 2014, the military initially claimed the Chibok students had all been found but was forced to backtrack when parents and the school principal said otherwise. As the issue gained world attention, via the hashtag #BringBackOurGirls, the then president Goodluck Jonathan was criticised for his lacklustre response. Jonathan’s handling of it was seen as contributing to his 2015 election defeat to Buhari, who promised to bring the Boko Haram insurgency to an end. But despite Buhari’s repeated claims the group is weakened to the point of defeat, civilians remain vulnerable to suicide attacks and hit-and-run raids. The attack in Dapchi will again raise questions about the government’s grip on security. Security analysts told AFP on Tuesday that government ransom payments to secure the release of the Chibok girls could have given the under-pressure group an incentive for financing. “They need money for arms, ammunitions, vehicles, to keep their army of fighters moving across the borders,” said Amaechi Nwokolo, from the Roman Institute of International Studies.